On the Cruising Guide to New Caledonia we have a special section on staying healthy while cruising in the tropics. One of the important things you need while cruising anywhere is a reliable source of fresh water. Of course the best answer to fresh water is a good water maker and you can read about the best cruising desalinator, the Echo Tech watermaker here. But for many years before we had a desalinator we relied on our super water-catching awning. These days we use the awning mostly for keeping cool during the hot summer days in New Caledonia but it still does a super job of catching rain. Two gutters run along the entire bottom edge of the awning and drain with nylon through hull fittings - normally into a 25-mm hose leading to the water deck filling fittings (the blue circle on deck in the photo). The awning is cut so the rain runs down into the gutters and then forward to the drains. We use the main halyard and the topping lift to hold the center of the awning straight and off the boom. 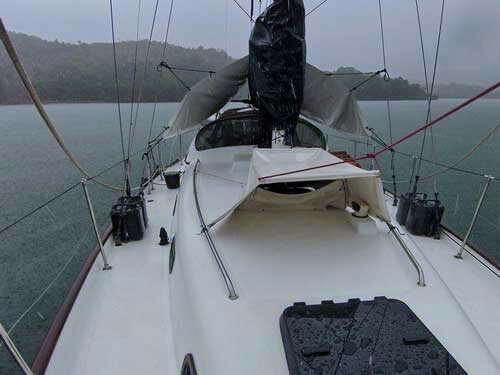 There are ties forward to the shrouds and one tie aft to the backstay. A PVC pipe is used to spread the back of the awning with tie-downs on either end of the pole. One of the more interesting things about this rain catcher is that we had it made in Sydney in 2000 - 17 years ago - and it is still in perfect condition. There are two reasons for it's longevity. First, it is made of a special plastic fabric used for making those huge banners that are stretched across streets to advertise upcoming events. It is called "Banner" made by Bainbridge. It has a black layer laminated between two white layers. The white layers reflect light but the black layer absolutely blocks all light, including UV, from penetrating. The idea, of course, is to be able to have writing on both sides of the banner. The awning maker in Sydney used it for commercial shop and open area awnings. On roasting hot tropical summer days there is no UV and very little heat in the shade of the awning. The black layer also greatly increases the longevity of the plastic in the tropical sun. Banner is designed to stay up in very strong winds - it's tough stuff. 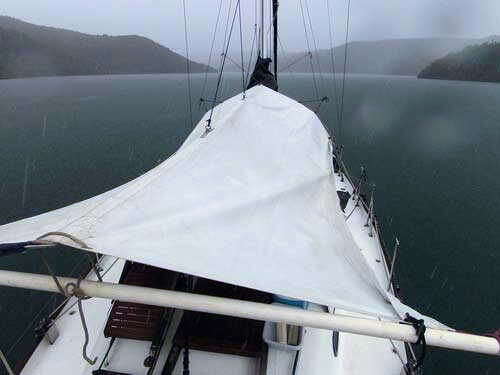 The stainless eyes pressed onto the edges for the ties show no signs of wear and tear and we leave the awning up in winds up to 40 knots. The material is also designed to be "welded". The first thing to fail on most awnings is the stitching. So we had this awning entirely made by welding the seams. After 17 years of use the welds are as good as the day they were done. We also have a small cover that floats over the main cabin hatch. 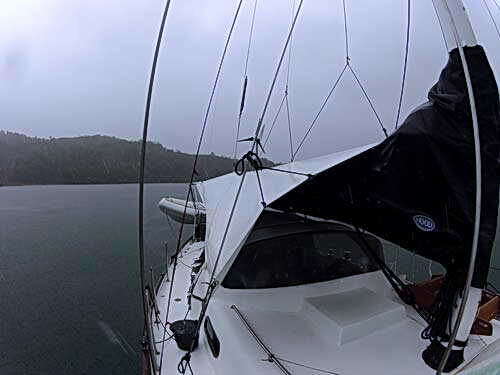 It has a zippered insert that enables us to have a nice breeze through the main cabin even when it is pouring rain. This little cover is also very welcome because it shades the main hatch on sunny days keeping the dinette (where I normally work on the computer) cool and shady. The comprehensive and accurate, easy to use, interactive Rocket Cruising Guide to New Caledonia has a special section on how to stay healthy while cruising in the tropics and what to do if you don't. Plan your cruise in advance and have more fun when you arrive.